“Being a woman is hard work”, Maya Angelou. There can be little doubt that fibromyalgia has become very prominent as a serious social and personal condition that affects primarily women. In fact, it is said by some that it is an epidemic of great proportions. Loss of work, physical impairments and challenges, intense pain, decreased income for many, increases in medication consumption, burdens on the health care systems and family disruptions are among the many serious outcomes of this debilitating syndrome. The numbers of people, mostly women, often middle age-aged, who suffer from this condition far outnumber the numbers of those who suffer from such a horrific life threatening disease as HIV/AIDS, even though fibromyalgia is not in and of itself a threat to life. While I do not suggest that comparisons should be made, or pitting one bitter struggle against another, nonetheless, both HIV/AIDS and fibromyalgia suffer from social stigma, as did the tuberculosis epidemic of decades ago. Among the interesting facts about FMS is that the numbers of people affected are not precisely known; many go undetected or underreported. There is no ‘scientific’ test with which to make a diagnosis, unlike other epidemics, such as the relatively recent SARS scare that Canadians experienced; nor is the general public afraid it can be ‘caught’ from others. However, like many other epidemics there is a degree of shame with admitting one has this condition as there are many skeptics who do not believe the syndrome even exists. Physicians are generally loathe to ascribe the label and yet, fibromyalgia and the ‘symptoms’ are universal across countries, cultures and various ethnic groups. Morever, it is a condition that affects mainly middle-aged women. It has become a label that people are stigmatized with and not anxious to advertise about being one of its sufferers. I theorize that is because it has become known as a ‘women’s disease‘, based upon perceived undesirable weak personality characteristics of females. 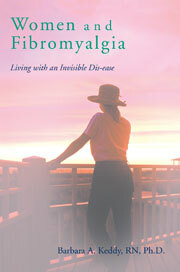 Equally as interesting is the Gulf War syndrome which I equate somewhat with fibromyalgia in my book. The veterans with this condition are often stigmatized as well. Are they also perceived to have ‘peculiar’ mental conditions that show signs of the so-called ‘weaknesses’ of women? There are many questions to be asked regarding why conditions that are invisible to medical testing are considered to be non-existent to many. This entry was posted in 'adapting', 'women's' condition, American College of Rheumatology, dis-ease, doubters, epidemics, Fibromyalgia, Gulf War Syndrome, Lyrica, New York Times article, stigma, walking in our shoes on January 20, 2008 by Barbara Keddy.